Girls Wear Blue Too: More tiles and a swap update. More tiles and a swap update. Here is what I did with the ble and green tiles using my Dec DT kit from OSS. We have just a few places left for the swap but Jaki made a suggestion that made a lot of sense which is that 16 embellished tiles can get very busy and not mesh well so it might be nice to leave a few 'blank' for us to do plainly, to tie the set we get back together nicely. Is everyone happy with that? If so we will close it off now, giving us 4 tiles to do for ourselves. Participants are Myself, Brenda, Phillipa, Pansy, Glennie, Maria, Gillian, Jaki, Ann, Sam, Sharon, Carole and Debbie. Getting excited about the tile swap...thinking cap is on! I am happy to go along with the 4 blank too. I'm happy with that too. Seeing the we are in the festive season I am going to stick with that and go with red, green and gold the Chrismassy kind. 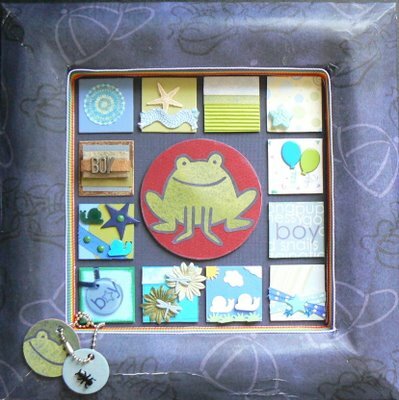 I love that frog frame Tammy. Looks great and I can imagine something like that in the kids bedrooms. yep Tammy, great idea to leave some tiles blank. Hi Tammy that is a lovely idea. Looking forward to starting.. January will be here before we know it. Just love your little boy tiles, they came up a treat in that frame. just lovely. ready and willing can't wait to start, this is going to be so much fun, just love what you have created. I am happy with what you have suggested. I'm happy with this too Tammy !! This is so nice !! I have to try this!!! LOVE IT!! !